The NEMESIS has a deep tub concave and a 1" dropped platform. The platform is large enough to feel comfortable no matter what the occasion - perfect for quick aggressive manoeuvring. Lighter and shorter than the Demonseed the NEMESIS gives the rider the comforts of the world's best downhill board in a tighter smaller package making it ready to thrash tighter turns. Slashing your way through allies or effortlessly bombing the steep grade this villain is shaking things up. The variable wheelbase at 32" and 33"allows the rider to customize their set-up. The taller ride height of the NEMESIS allows the rider to leverage their turning while still maintaining a low center of gravity. Wheel Base- 32" or 33"
Pre-tensioned fibreglass - Adds long life, durability, strength and energy return. Twin Shape – Freedom to choose any path or direction. 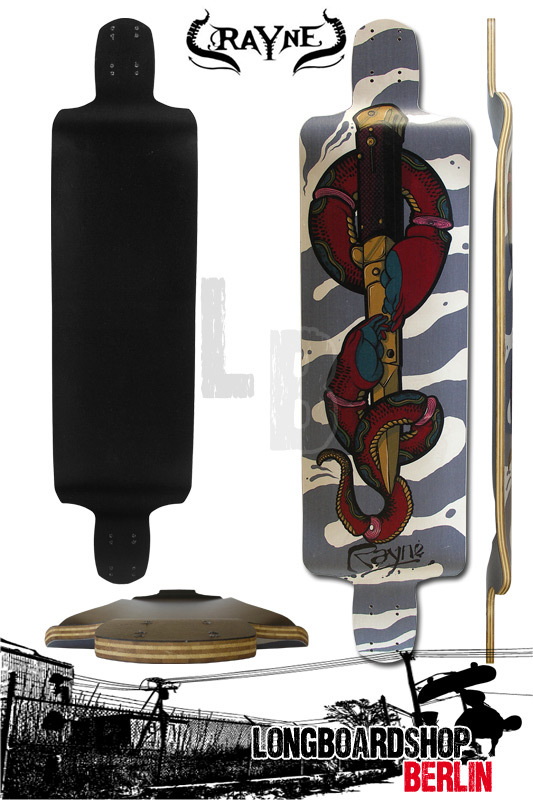 Sublimated Artwork - Scratch-resistant ink is tattooed into the deck. Speed-stiff - Don’t get bounced! Stiff boards will make you stable at high speeds. Linear Drop Platform – Keeps your feet locked into place. Ideal for freeriding. Deep Tub Concave – Designed to cup the toes and heels for quick, precise turns. Bee Orange Finish - Enhances and tones the natural wood grain while protecting with an excellent wax barrier that repels water. The citrus-based polish is completely free of harmful chemicals and is an environmentally sustainable product.